Sutchi catfish Pangasianodon hypophthalmus hatch with morphologically immature sensory organs; however, sensory organs develop rapidly with larval growth. Two-day-old larvae commenced ingesting Artemia nauplii. The larvae displayed many taste buds on the barbels, the head surface, and in the buccal cavity. Other sense organs were also well developed at this stage. Feeding experiments revealed that 2-day-old larvae ingested Artemia under both light and dark conditions, moreover, the larvae could ingest frozen dead Artemia. The ingestion rates for 4- and 7-day-old larvae were significantly higher under dark conditions than under light conditions. The rates using frozen dead Artemia were mostly higher than the rates using live Artemia. Therefore, feeding behavior under dark conditions is most likely not mediated by visual or mechanical senses, but rather by chemosensory senses, such as taste buds. Larval fish are vulnerable to predators; thus, if they can search for and eat food at night, they can avoid diurnal predators. The behavior observed here appears to represent their survival strategy. 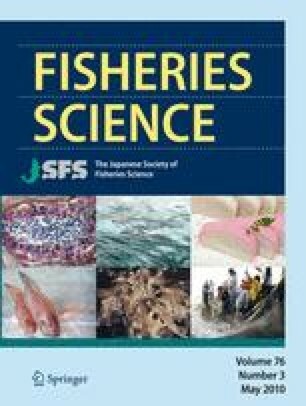 Moreover, these results suggest a new possibility that sutchi catfish larvae can be reared under dark or dim light conditions in order to improve survival and growth rates as in the case of African catfish Clarias gariepinus. We would like to express our sincere thanks to Assoc. Prof. Dr. Abdul Hamid Ahmad, Director of the Institute for Tropical Biology and Conservation of Universiti Malaysia Sabah for his cooperation in using SEM. This study was supported by a Fundamental Research Grant (FRG 0002-ST-1/2006) from the Ministry of Education of Malaysia and the e-Science Fund (05-01-10-SF0054) of the Ministry of Science, Technology and Innovation of Malaysia.